Figure 2.2 The K-T boundary at the scale of the impactite level showing the iridium anomaly and fern-spore spike at the Sussex locality in the Powder River Basin (see Section 7.4). Enlarged detail below shows microstratigraphy of the boundary interval including mudstone bearing Maastrichtian pollen overlain by impactite deposits beneath coal of earliest Paleocene age. Peak iridium anomaly and most shocked quartz grains are present in carbonaceous mudstone above the K-T boundary clays-tone. Data from Nichols et al. (1992a). iridium at the K-T boundary, which is measured by neutron activation analysis (e.g., Alvarez et al. 1980; Orth et al. 1981, 1982), is commonly referred to as the "iridium anomaly'' because its abundance can be hundreds of times greater than the normal background level of this element in sedimentary rocks. The greatest iridium anomaly so far detected at the K-T boundary in nonmarine rocks is 71 nanograms per gram or parts per billion (ppb) (Vajda et al. 2001); measurable background levels of iridium in nonmarine rocks can be as low as 0.010 ppb (Orth et al. 1987). 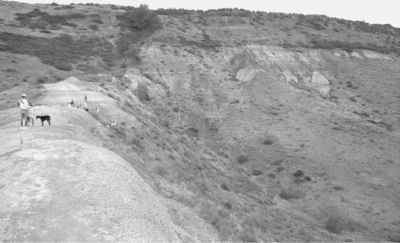 The claystone layer is interpreted to have originated as impact ejecta that was diagenetically altered to clay (Hildebrand and Boynton 1988, Smit 1999). Good examples of the K-T boundary claystone layer, which is 1-2 cm in thickness at most localities, are described and illustrated in Section 7.2. Within or closely associated with the boundary claystone layer at many localities is mineralogic evidence of its impact origin: shock-metamorphosed mineral grains ("shocked quartz'') and spherules. Shocked mineral grains exhibit multiple sets of parallel microfractures (Bohor et al. 1984, Izett 1990). The forces necessary to create such features are produced only by meteorite impacts or nuclear explosions and are never found in volcanic rocks (Izett 1990). Spherules are small glassy microtektites that cooled from melted rock that was ejected into the atmosphere by the impactor and then rained back to Earth. They are now altered to kaolinite or other minerals and are well known in marine sediments at the K-T boundary. Alteration tends to obliterate spheru-litic structure in the boundary claystone, but well-preserved spherules are reported in nonmarine rocks at some localities (e.g., Bohor et al. 1987a). A significant indicator of the K-T boundary is an anomalous concentration of fern spores just above the level of the extinction of Cretaceous pollen. A true fern-spore abundance anomaly or fern-spore "spike" is not simply a concentration of diverse fern spores. The fern-spore spike was originally observed by Orth et al. (1981) and first described by Tschudy et al. (1984). It was codified by Fleming and Nichols (1990), who formally defined it as a palynological assemblage composed of from 70 to 100% fern spores of a single species occurring within an interval 0-15 cm above the K-T boundary. The origin, expression, and interpretation of this phenomenon are discussed at length in Section 5.3. It is mentioned here because its presence may be used to confirm identification of the K-T boundary. Some additional features of the K-T boundary at the impactite level of resolution have been reported in nonmarine rocks, but they have not been used to identify the boundary in sections where it was not already known. Shifts in ratios of the stable isotopes of carbon of about two per mil have been detected (Schimmelmann and DeNiro 1984, Beerling et al. 2001, Arens and Jahren 2000, Arens and Jahren 2002, Gardner and Gilmour 2002), and microscopic diamond crystals (microdiamonds) presumably derived from the K-T impactor have been reported at a few localities (Carlisle and Braman 1991, Gilmour et al. 1992, Hough et al. 1995, Carlisle 1995). By definition, the K-T boundary is represented by the Global Stratotype Section and Point (GSSP) established by the International Commission on Stratigraphy at El Kef in Tunisia, a site that occurs in marine rocks but also contains terrestrial palynomorphs. Terrestrial K-T boundary sections can only be validated if they can be shown to be coeval with the K-T boundary stratotype section. The burden of proving synchronicity is particularly heavy in the case of the K-T boundary, for which the putative cause is a bolide impact that occurred in a literal instant. In the best cases, those employing high-resolution geochro-nology or marine cyclostratigraphy, temporal resolution for the end-Cretaceous is about 20 thousand years. This represents one Milankovitch cycle in cyclostratigraphy or a one-sigma error of 0.04% in either the U-Pb or the 40Ar/39Ar decay series. It also is equivalent to the length of a typical Pleistocene interglacial interval. This is an inconvenient but critical fact: we do not have the direct temporal resolution to measure K-T boundary events on the time scales at which they occurred. Despite this limitation, we do have the ability to look at the relative timing of events in a microstratigraphic sense, and there are reasonable inferences that can be drawn from the nature of the stratigraphic record. All K-T boundary studies are hampered by the resolution of time in the rocks being studied, but some are much more challenged than others. Studies that only achieve the stage or subchron level of resolution are common, and the results and interpretations must be taken in this light. One could make the argument that only the studies that achieve all three levels of resolution are directly germane to understanding the K-T boundary event, but because many areas around the world have yet to achieve triple-resolution status, we feel it is important to identify and discuss them for their future potential. 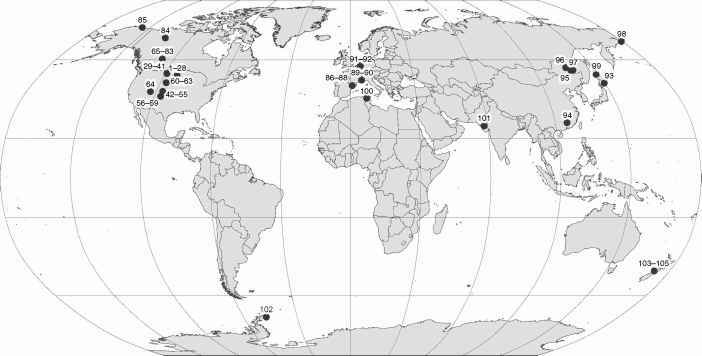 The global distribution of published K-T boundary localities in terrestrial rocks is shown in Figure 2.3. Figure 2.3 Map of the world showing the locations of the K-T boundary sections in nonmarine rocks listed in Table 2.1 and Appendix by locality numbers.